Okay so I completely dropped the ball this week. AGAIN. It took me way to long to get this post out. In fairness the last week was very busy, I tried to get the post out before Wednesday because from Thursday - Sunday I was barely home or had a house full of guests. All of which I will get into in the next post. For now, get gooey. Do you ever get so excited about wanting to do a recipe that you don't properly read the ingredients. This happened with these bars. I turned a single batch into a double batch due to lack of reading, oops! 1) Preheat the oven to 350F. Combine the flour, espresso powder and sugar in a large bowl. 2) Blend in butter with your hands until incorporated and slightly crumbly. Press into a 9x13 pan. 3) Bake shortbread for 5 minutes. then reduce oven temp to 300F and bake for approx. 40 min. Edges will be golden and no longer doughy. Remove from oven and let cool. 4) Melt butter in a large bowl, mix in corn syrup and condensed milk and whisk together well. 5) Place the bowl over a pot with simmering water, using the double boiler method. This method will take about 2 hours for the condensed milk to thicken and darken. Let cool and sit once darkened. 6) Pour this mixture over the shortbread and allow to set, in fridge or counter. 7) Melt the chocolate in a large bowl also over a double boiler and pour this mixture over the caramel layer. Spread with an offset spatula and let set and cool. These are very gooey. Although insanely yummy I would want to use a different caramel filling so that it would be harder and not so gooey as serving these can become tricky. 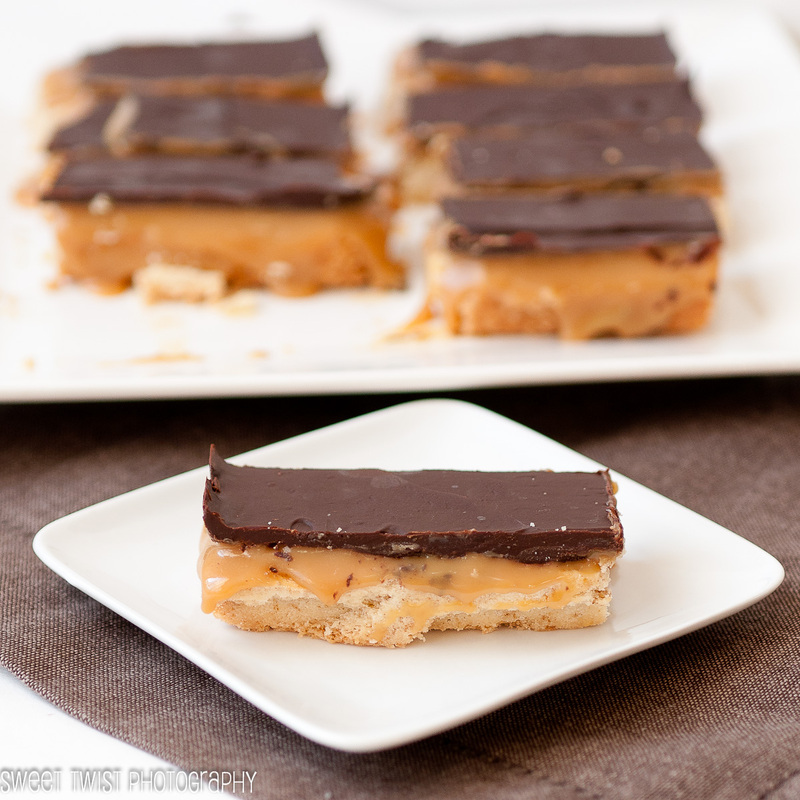 I did love the addition of the espresso in the shortbread, it paired so well with the caramel and chocolate. 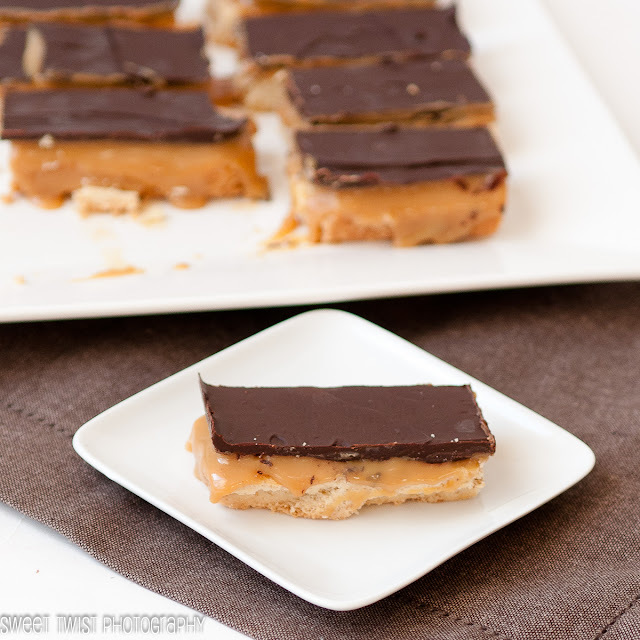 This post was added to Crazy for Crust - Crazy Sweet Tuesdays! I'll have to make these. They look really good! Believe it or not I;ve never made a shortcake. every time I;m thinking this week I'm going to make one and then it just slips my mind. I made the cheesecake, it was very very very good. My husband and son loved it! I will post it on Friday so I will leave a link for you. It will all sound Greek to you but at least you can see the pictures. :) Have a nice week Meg! Eri : Great!! Can't wait to see it! These look insanely good! I will have to try them soon but I'll have to make sure it's when company is coming over or I'll eat the entire batch!